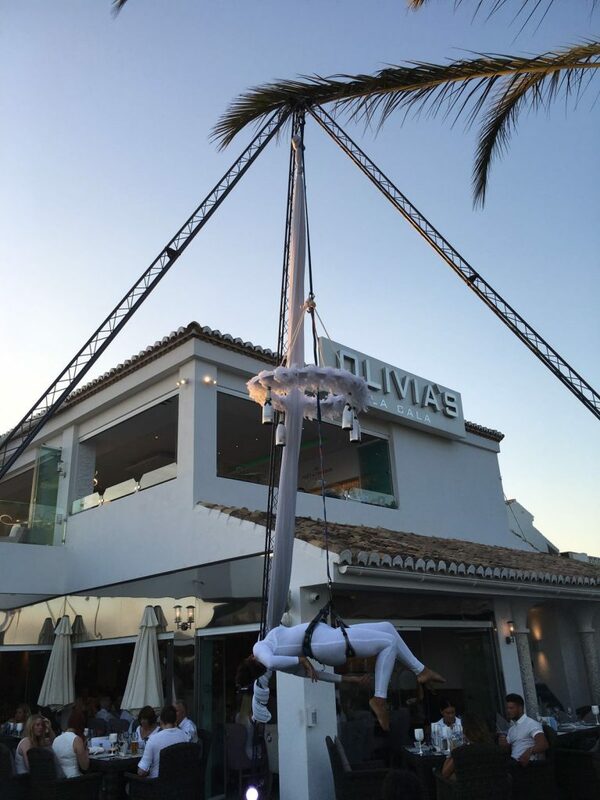 Our Aerialist & Acrobatic Dance Acts are suitable for any type of Events – be it a trendy party or a Corporate Event – even Wedding clients book us mostly for the Cocktail Reception! The Aerial “Drink service” is an approximately 2 or 3 times 5 to 7 min performance …Whilst one of the acrobats is suspended upside down – she or he will pour drinks into glasses that her/his assistant ( who is part of the act) brings to her. After a short acro- aerial dance she serves drinks then takes a break whilst her colleagues perform an acrobatic dance ( if booked as a group)on the ground then another acrobat will be suspended and carries on with the drinks service. Please note that this is a very visual act – and the drink service is more of a unique novelty show rather than a full drink service of the guests. (Depending on the size of your party, You or the venue may need to provide extra serving staff so all guests shall be served drinks.) The Act does not include the drinks and glasses. Champagne cocktail hanging aerial balancing artiste.